Man is steel. The tank is only iron. watching them patrolling in front of you. I want you to feel it. Because in this case feeling is understanding." I've never taken part in military action and don't believe that I'd necessarily be a better person for having done so. While the prospect of capturing the specifics on battle on camera is one that most filmmakers and photographers can't help but respond to, to actually walk into a war zone and be ready to kill is an experience that most of us can only pretend to relate to. I do know people who have fought in wars and survived, and my conversations with them have established one thing for certain – unless you've been through it, you genuinely cannot imagine what it feels like, no matter how hard you might try. As self-appointed film readers with no combat experience we are thus not really qualified to comment on the authenticity of cinematic portrayals of warfare. The best we can do is to note when a film feels authentic, when the detail is convincing and the characters react in a manner that seems real. It's worth remembering, of course, that a good many of modern filmmakers are also working from a combination of research and supposition and have never actually been under fire themselves. There are notable exceptions, of course, and I have little doubt that the vividly authentic feel of the jungle and battle scenes in Platoon is down in no small part to the fact that writer-director Oliver Stone was drawing directly on his own experiences as an infantry soldier in the Vietnam war. Israeli filmmaker Samuel Maoz certainly knows a little bit about life in a combat zone. As a 20 year-old recruit, he was a gunner in one of the first Israeli tanks to cross into Lebanon in June of 1982, and the traumatic events of his first day of action have haunted him ever since. As he states at the very start of his commentary track, "I was a soldier in the IDF during the first Lebanon war in '82. It took me more than twenty years to deal with those issues and to tell my story, and as I'm a film director, I made it my way." It's an approach to past events that he shares with his countryman Ali Folman, whose extraordinary animated Waltz with Bashir [Vals Im Bashir] grew out of his need to come to terms with his shattered memories of the 1982 Sabra and Shatila massacre. Where Folman unlocked the past through interviews with his fellow soldiers, Maoz recreates that fateful first day by forcing us to see and experience events exclusively through his eyes and those of his immediate comrades. Maoz spent his entire first day of action inside his tank, and save for a pair of startling sunflower field bookends, that's where the entire running time of Lebanon plays out. It's a strategy that should theoretically prove dramatically monotonous and risk distancing us from the horrors that Maoz clearly wants us to witness. But it pays off. Oh boy does it pay off. Standing in for Maoz here is Shmulik (Yoav Donat), who at the start of the film joins tank commander Assi (Itay Tiran), driver Yigal (Michael Moshonov) and gun loader Herzel (Oshri Cohen) shortly before their vehicle is due to cross the border into Lebanon. After ploughing through a banana grove they come to rest at a designated point on an isolated road, where they are visited by no-nonsense officer Jamil, who dourly outlines their tasks for the day. The first is to fire warning shots at an approaching car, but when it refuses to stop, the inexperienced Shmulik ("Till now I shot only barrels...") is unable to shell the car as ordered and the resulting fire-fight results in the death of a soldier from the platoon that they are there to support. To add to Shmulik's sense of guilt and failure, the man's body is placed in the tank for transportation to a pick-up point. When he does open fire on a second vehicle, more out of terror than any real desire to shoot, the resulting explosion leaves its civilian driver dismembered and screaming. Just sixteen minutes into a ninety minute film, in the exclusive company of characters that are initially difficult to tell apart, we've already been dealt two emotionally powerful body blows. 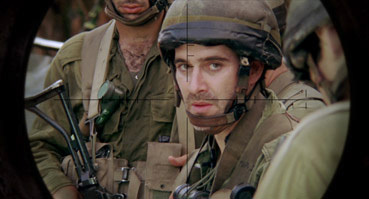 By trapping us in the tight confines of the tank, Maoz focuses our attention on the emotional condition and responses of its occupants, their view of the world outside of the vehicle confined to the chatter of radio communication and what Shmulik is able to see through the scope he uses to target the guns. This provides a first-person viewpoint of outside events, one restricted to a single angle that can only be altered by physically rotating the gun turret and whose magnification changes are accompanied by a punctuational 'pop', which transforms every observation into a small statement about the conflict. It's an unusual but strikingly effective technique that economically lets the images do the talking: the dazed face of a boy in the bombed-out village; the still breathing nostrils and tearful eye of a disembowelled donkey; the blood-soaked meat hanging in the window of a wrecked butcher's shop; the stony contempt on the face of a surviving elder; the religious painting on the wall of a damaged house; the burnt and bloodied bodies of dead civilians. This guilty observation reaches an emotional peak with the traumatised woman who emerges from a house in search of her child, the last remnants of her dignity stripped as her burning clothes are torn from her body. Wrapped in a blanket, she looks dazedly around her, then walks up to the tank and looks directly into the scope in a manner that feels as accusatory as it is confused and questioning. Our rapid engagement with the tank crew is as much down to a very real empathy with their situation as it is to the conviction of the performances. These are boys forced to behave in a manner for which they are emotionally unready, something illustrated early on by their childish bickering over who should stand watch, and later by their dillusional attempt to convince both themselves and the unsympathetic Jamil that they should be allowed to go home because the dials on the tank's control panel no longer respond. Their very tangible terror when the platoon find themselves in unprotected territory is less that of soldiers concerned for their safety than of vulnerable young men who are unable to comprehend their situation or how to correctly react to it. Maoz turns this to narrative advantage with the arrival of a Phalangist fighter who has been called on for help, aware that his audience will probably have a better idea of the potential threat he represents than his still naïve soldiers. This is confirmed when he cheerily inquires if the crew can speak Arabic, seemingly an the attempt at friendly communication, but actually a language check that will allow him to spell out to a Syrian prisoner in terrifying detail the tortures that await him on arrival at their destination without the soldiers realising what he is saying. By this point the tank has suffered rocket attack damage and is starting to feel less like an armed fortress than a mobile coffin. This is war stripped of heroics and artificial thrills and any real sense of purpose, leaving us only to contemplate its destructive consequences and the effects on those charged with fighting in its name. That it was drawn from personal experience is clear even before you listen to the commentary track, evident in its focus on the reactions and emotions of the crew and the sort of observational detail that it would never occur to others to include. The absurdity of the conflict is also slyly captured in the designated euphemisms used for combat reports: the code name for the squadron is Crown Cinderella, the tank is a Rhino, and attack planes are Wild Birds, and to bypass an international ban on the use of phosphorus bombs they are officially referred to as "flaming smoke." 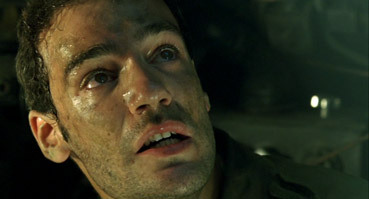 A wounded soldier is called a Flower, and if he dies he becomes an Angel – it's a measure of the film's thematic subtlety that when the body of Shmulik's dead comrade is removed from the tank and pulled up up into the daylight to the words "Angel is coming up! ", the religious overtones take a short while to register. Where to stop? There are so many good things to talk about here that there comes a point when you just have to quit and just implore others to see it, something I've been doing with a passion since my first viewing. On the commentary track, director Maoz outlines in some detail his intentions for the film and for my money he absolutely succeeds in all of his set goals, and then some. Lebanon is genuinely extraordinary achievement, a small-scale, personal war story that involves you to the degree that you absolutely share the horror, confusion, apprehension and terror of the tank crew. It's a testament to just how involved I became that only on the second viewing did I begin to fully appreciate the work of the actors (everything from their expressions to their body language feels genuine), of cinematographer Giora Bejach, of production designer Ariel Roshko, of composers Nicolas Becker and Benoît Delbecq, and especially of sound designer Alex Claude and his team, who create a most convincing sense of a war is taking place just beyond the confines of a tank with little in the way of visual assistance. The result is everything a great modern war film should be: compelling, disturbing, frightening, character led and thought-provoking, and cinematically it manages that oh-so-rare trick of taking you somewhere you've never been before. It's already one of my favourite films of 2010 and unquestionably one of the best and – yes – most authentic war films I've seen in many years. A first-rate 1.85:1 transfer with pin-sharp detail and well judged contrast, important for a film whose action takes place largely in the gloom of a tank interior, although director of photography Giora Bejach has lit these scenes in a manner that retains clarity without sacrificing a micron of atmosphere. The earthy hue of the colour scheme inside the tank feels appropriate to the grime and the artificial lighting within – images seen through the scope are more naturalistic in colour. I'll bet the Blu-ray looks lovely. There's a choice between Dolby stereo 2.0 and Dolby 5.1 surround, and while the stereo track is fine, if you really want to get the most out of the experience then the 5.1 is the only way to go, and if you don't have a surround system then seriously think about taking the disc round to the house of a friend who does. It's a long time since I've heard a surround track that is so completely integrated into the action as this one – from the thunderous rumble of the tank in motion to the deafening roar of the overhead helicopter and the passing fighter planes, there's a vivid sense of being inside the belly of the vehicle in which the film is set. It's worth having the sound at a decent level to get the full effect, but be warned, the effects are noticeably louder than the dialogue, not through unbalanced mixing but because that's exactly how they would sound in the real world – in the scene when there body is lifted from the tank, the helicopter engine and rotor completely (and deliberately) drown out the dialogue. Clarity is excellent throughout on both tracks and the range sublime. Superb. The English subtitles appear to be fixed and continue even when the characters speak English, though do usefully identify when Arabic is being spoken, which is important to one scene. Softly delivered in sometimes hesitant English, this is a hugely important and compelling track in which Maoz discusses his own true-life experiences on which the film is closely modelled. The first part in particular, where he recalls his emotions and reactions to the events recreated here, makes for sobering but fascinating listening – "I was there," he says of having to transport the dead soldier, "with the body behind me, tearing at my back, the soldier who died because of me" – and we're left with the impression that these early scenes have been filmed almost move-for-move as they actually happened. As the film progresses the commentary becomes less screen specific, as Maoz discusses the experience of fighting in Lebanon and living with the memory, how young men are turned by war into killers, the cast and locations (there's less on this than you might expect), his decision to restrict the action to the tank interior, the process of writing and directing the film, and his hopes for the effect it may have an audience – "I'd rather change one Israeli mother's opinion," he says, "than satisfy a hundred intellectual journalists." A Background to the First Lebanon War is a textual feature that provides a useful timeline to events leading up to and following the 1982 Lebanon war. If you're not that well versed in the history of the conflict this is one extra worth checking out before the main feature. Views From the Front Line is another textual extra in which Maoz provides some background to the film, and production designer Ariel Roshko, cinematographer Giora Bejach and actor Yoav Donat (who plays Shmulik) talk briefly about their involvement in it. The Theatrical Trailer (2:35) gives a reasonable flavour of the film, though inevitably highlights the action and tension. You can also access a Digital Copy of the film and some on-line extras by inserting the disc into a PC or Mac, or so we are assured, but the Mac version doesn't seem to work, even when I found the SWF file that is supposed to activate the link. The PC version kicked in when I double-clicked the Start.exe file (the autorun file did nothing) and was ready to allow me to transfer a digital copy of the film directly to my iPod, but as it wasn't synced to that machine I've yet to actually try it. As far as on-line extras go, there's just a YouTube version of the same trailer on the disc and three wallpaper pictures from the film. Quite simply of one the most involving and vividly realised personal war films I have ever seen, Lebanon (which for reasons unknown has been subtitled on the disc as "A Soldier's Journey"), like its stable-mate Waltz with Bashir, is drawn directly from traumatic personal experience and is all the more potent for it, deglamourising the war and presenting it exclusively from the viewpoint of ordinary young military conscripts in reamarkably persuasive fashion. The DVD looks as sounds terrific and the commentary provides a sobering insight into the reality that inspired it. Whether you go for the DVD or the Blu-ray, it's a film you should definitely see. Highly recommended.